The Board of Management and Board of Governors of Bandon Grammar School, Bandon, County Cork announced today that Mr David Sutton will retire as principal at the end of August. 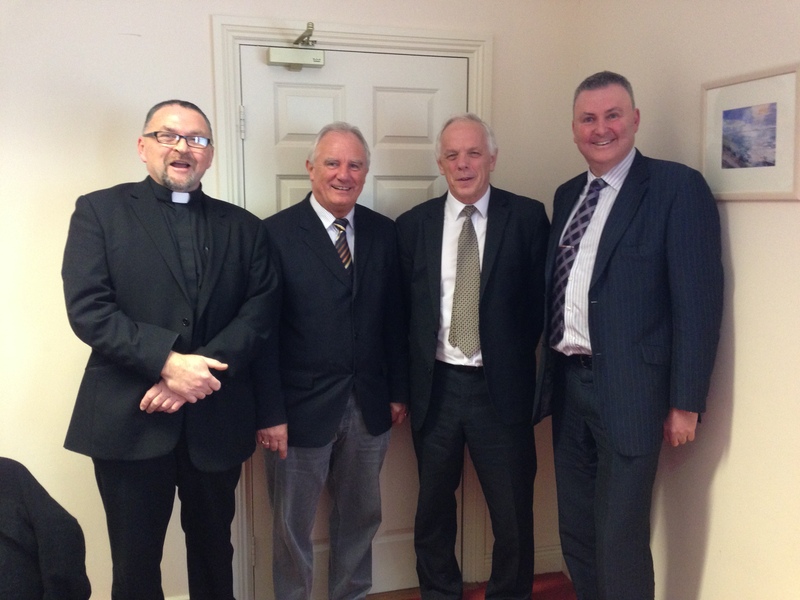 David Sutton (second from right) pictured with (from left) Canon Paul Willoughby, chairperson of the board of management of Bandon Grammar School, Sean Crowley (deputy principal) and Bill Skuse, chairperson of the board of governors. Although Mr Sutton has only been principal for just over four years, he has been the instigator of great change in that short time. On his appointment he had a ‘wish list’ of developments that have all happened under his leadership. A new Board of Management structure is in place and the Church of Ireland ethos has been greatly strengthened with the appointment of The Reverend Anne Skuse as the first Chaplain at the school. The extensive building project, paid for entirely from school funds, now completed, has created a modern, vibrant school with over 600 pupils, four year streams and a dedicated, enthusiastic teaching staff. Dave has been a wonderful principal of our school and he will be a huge loss to all of us, especially the pupils. The warm, welcoming atmosphere in the school, the mutual respect between staff and pupils, the strong sense of ethos and the low instance of disciplinary issues are no accident. All are evidence of Dave’s calm guiding hand, his wisdom and experience and his great love for this place. We wish Dave, Joan and their family every blessing in the future. We will miss him. Before becoming principal Mr Sutton was a greatly loved and respected teacher, keen sportsman and valued staff member at Bandon Grammar School. Originally from Co. Wicklow, David was educated at Masonic School, Dublin and Trinity College. He taught at the King’s Hospital, Palmerstown and Wesley College, Dublin before moving to the UK where he taught at Riverstown School, Eltham, London from 1977 to 1983. Mr Sutton then came to teach at Bandon Grammar School and has played a huge role in building an excellent Geography department and coached the Senior Rugby Team for many years garnering a number of trophies. Here his experience from his playing career on the TCD First XV and as an Irish triallist came to the fore. I am very proud to have been appointed Principal of this excellent school and I have really enjoyed working with all of the partners involved in it. This entry was posted in Announcements, Diocese, Retirements, Schools in the Diocese. Bookmark the permalink.